Version I: As shown. Collections: National Portrait Gallery; British Museum. Version III: As shown, but with title in open letters. Note: The engraving was published in London. 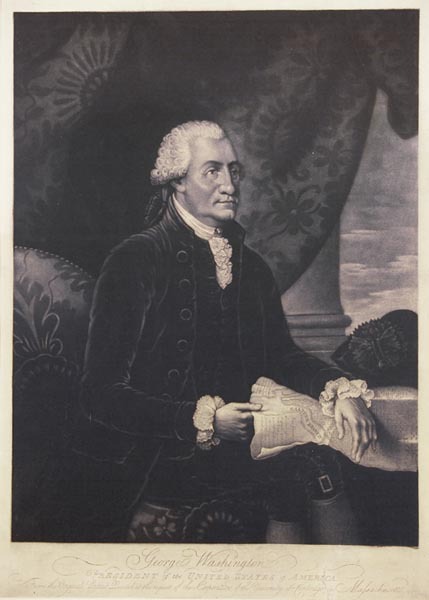 Savage sent a copy to George Washington on 6 October 1793 (together with an engraved portrait of Benjamin Franklin), writing in his accompanying letter: "I have taken the liberty to send two prints. The one done from the portrait I first sketched in black velvet, labours under some disadvantages as the Likeness was never quite finished. I hope it will meet with the approbation of yourself and Mrs. Washington as it is the first I ever published in that method of Engraving."